Related to: Compartmentalization in epistemic and instrumental rationality; That other kind of status. Summary: I’d like to share some techniques that made a large difference for me, and for several other folks I shared them with. They are techniques for reducing stress, social shame, and certain other kinds of “wasted effort”. These techniques are less developed and rigorous than the techniques that CFAR teaches in our workshops -- for example, they currently only work for perhaps 1/3rd of the dozen or so people I’ve shared them with -- but they’ve made a large enough impact for that 1/3rd that I wanted to share them with the larger group. I’ll share them through a sequence of stories and metaphors, because, for now, that is what I have. For me, these techniques came out of a stressful time period. In October 2012, CFAR was very new, and I was very new to being its executive director. I was faced with a task that I basically didn&apos;t know how to do -- filling the first workshop for which we charged "real" money (the $3900/person that actually let CFAR run), and helping our team create our first decently polished workshop at the same time (which needed curriculum, operations, etc.). But whenever I sat down to try to work, my head would fill up with all the other tasks I “needed” to get done, instead of the particular task I was trying to work on. Or my head would fill with stress and mental static. So, almost because of how badly I needed to work, I found myself unable to accomplish much of anything. One morning, that month, I was lying in bed, half-asleep. And I wanted my laptop. But my laptop was a few feet away, so reaching it sounded hard (because I was half-asleep). I’m going to call this process “Attempted telekinesis”. It seems to me that something like “attempted telekinesis” underlies a large set of stress / shame / worry / etc., and that learning to vanish it has been super-useful for me and several others. I’ll start with several examples of what I’ll be calling “attempted telekinesis”, and then go into some techniques for vanishing it. Later that day, I was sitting at the office trying to work, and someone next to me was eating. Noisily. Now, I’m part of the sizable minority of the population that is driven absolutely bonkers by munching noises. Munching noises fill me with rage and make me want to punch someone. But, like, I get that that’s petty of me. My system 1/ intuitive brain (silently, in my head): Argh! Stop it! My system 1/ intuitive brain (silently, in my head): Didn’t you hear me?? Stop it!! My system 1/ intuitive brain (silently, in my head): Argh!! Didn’t you hear me?? Stop it!! Why won’t it stop!! Clearly I need to use even more emotional force to make it stop!! So, later on that day, I sit down to write some ad copy -- something I can email out to folks who might be interested in the workshop. And I notice that a bunch of my thoughts aren’t about the details of the ad wording at all -- they’re about whether I’m good enough at writing to write ad copy, and also about whether the whole workshop is doomed and I’ll be cast desolate to the hyenas while my entire tribe mocks me for having ruined CFAR. So I stop and think through my fears for a moment. And I agree that, indeed, the workshop might not work -- but since it also might well work, it’d be pretty damn stupid to stop preparing right then. And in fact, my useful “next actions” from this moment basically involve doing whatever’s most likely to make it work, and not wasting motions on the opposite prospect. Similarly, I might not be good enough at the writing -- maybe I should be getting someone else to write it for me. But since I might well be able to, and since there’s no one good sitting right there to give the task to instead, it seems best to set a 1-hour timer, do the best writing I can for 1 hour without distracting myself trying to evaluate it -- and then, when the timer rings, I can deliberately evaluate whether to write more myself or to look for someone else who can write it. But even after I think that through… my brain keeps on trying to waste these motions. It’s like “write… pause… `what if I&apos;m not good enough?&apos;”. And I notice that it has the same feel as the laptop and the munching noises. As though something in me hopes that if I just feel upset about things, or if I just visualize that I need the world to be a certain way or worry about how it isn’t, this will somehow magic the world into a better state. A musical artist once said: “You know, how good or bad you are [at making music] is really none of your goddamn business.” And I get what he meant, now. My business this hour is to write, not to worry about how I’m not good enough at writing. But how to do it? How to get my brain to focus on writing, and to drop the attempted telekinesis? 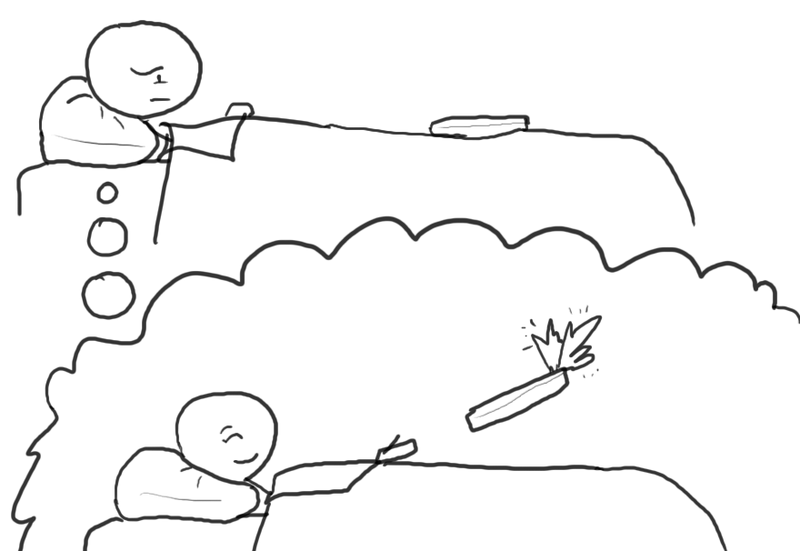 The “attempted telekinesis” examples above are all examples of pointless behaviors -- the kinds of behaviors a person is better off removing. I’d like to take a moment, now, to distinguish pointless cases of “attempted telekinesis” (where a person tries to change the world just by repeatedly stressing out about it) from their useful cousins. The other morning, I was lying in bed, again. Thinking that maybe I should get up. But feeling like bed was warm and getting up would be a little hard. As in the above "pointless" cases, my system 1 brain had a thing that it wanted, and visualized a picture of the desired end-state. But in the breakfast example, that visualization was useful. The imagined flying laptop had just filled my head with repeated wishing. The imagined vanishing munching noises had just filled my head with repeated aggravation. The imagined "being a better writer" state had only distracted me from writing. But the imagined experience of eating breakfast... pulled my system 1 into actually obtaining breakfast. Similarly, when I imagine Archimedes in the classic bathtub story, I imagine him obsessing a bit about how to measure the crown&apos;s density. "How can I measure it? How can I measure it?" his brain might repeat... a little like repeating "Get my laptop to whoosh toward me!". Obsessing on problems at CFAR certainly seems to help me notice potential solutions. So, what&apos;s the take-away? When is it useful to try to wish the world into a different state? What distinguishes the kinds of "attempted telekinesis" that one might like to remove, from the kinds that fetch you breakfast or give you insights into the king&apos;s crown? This matter seems to me to be a bit complicated, but also seems quite important -- if you get it wrong, you either stay unnecessarily distracted and ineffective (like me in the lead-up to CFAR&apos;s first workshop), or you end up a sort of parody of pop Buddhism, sitting there being placid about your problems instead of harnessing your drives to solve them. Examples: Making breakfast; causing someone to know you care about them. Suggested response: This sort of wishing is healthy, and may prompt actions that make a lot more sense than those system 2 would plan (e.g., your nonverbals as you apologize are likely to be far better if you viscerally care about your interlocutor). Leave system 1 be. Suggested response: Raise the problem to conscious attention; then, try to figure out what is bothering system 1; finally, decide what to do about it. As you do this, parts of the wishing will naturally shift from the general problem ("Somehow make work less stuck-feeling") to the specific strategy you&apos;ve chosen ("Figure out how to renegotiate with my manager"). Make a plan for what it would actually take to cause San Franciscans to be better drivers. Estimate the total amount of work involved. Ask your emotional brain if it would, in fact, like you to carry out this plan. Notice, in detail, what system 1 is upset about. Acknowledge that, yes, you may be late to your work meeting because of the traffic. And that, indeed, your personal driving habits are different from those of the driver who cut you off. And that someday a driver like that may in fact kill you via aggression or carelessness -- it isn&apos;t likely, but it&apos;s possible, and the lifetime risk of death by traffic accident is distinctly nonzero. Once you&apos;ve noticed all the painful things, check again to see whether it&apos;s worth taking some sort of constructive action on some of them. System 1 may trust your policy decision more now that you&apos;ve looked at all the downsides (and may be more willing, therefore, to stop trying to will the drivers into a different state). Examples: The problem of locating a workshop venue (during the hour at which I was trying to write the workshops ad, that October); the situation with your roommates and the dishes (while you&apos;re at work solving a coding problem). Suggested response: Designate a particular future-you to do the task. Dialog with your "inner simulator" (your system 1 anticipations) until both system 1 and system 2 are convinced that that specific you will actually do the task, and that there is no additional positive effect to be gained via staying preoccupied now. Suggested response: This sort of wishing is healthy. Leave system 1 be. Wishes often seem to me to have emotional tones. Some tones are simple desire (“Breakfast... mmm....”). Others have an overlayed hopelessness or bitter resignation about them (“I just always have to put up with how everyone else is incompetent”); others, still, have a tone (at least in me) of hammed-up flailing, self-pity, or desire for outside help -- as though if I just feel helpless enough, somehow a grown-up will come to the rescue ("Make the workshop crisis not be in this state... Make the workshop crisis not be in this state..."). It seems to me that it&apos;s worth installing an "alert" that sounds, in your head, whenever it hears either the hopeless/bitter/resigned tone, or the flailing/save-me tone. Both are often signs of buggy "attempted telekinesis" situations that are worth conscious debugging (a la the schema above). And the emotional tones can be easier to automatically flag. A book called "Bonds that make us free" played a substantial role in prompting these thoughts and was extremely helpful to me. It&apos;s written from a Christian worldview, but if you&apos;re up for navigating a foreign expository style and sorting out for yourself which parts to keep, and if in addition you are interested in vanishing social shame or other forms of loopy thoughts, I&apos;d recommend it. Thanks to Alicorn for making the cartoon. The book "Focusing" by Eugene Gendlin teaches one useful way to do this. If you decide to check it out, I&apos;d strongly recommend the audiobook over the paper book, as it is abridged and far clearer. More generally, when setting out to convince system 1 that X is true, it is best to be honestly curious as to whether X might in fact be false, and whether system 1 may have some good reason for suspecting this. It is much the same as when attempting to convince another human. Saying "Hey, look, you&apos;re wrong and stupid and so your proposed office policy is really bad" is usually not very persuasive; saying "huh; I&apos;m confused; the office policy looks to me as though it&apos;ll cost a lot of hours to little effect, but you usually have good reasons for things; maybe you could tell me why you think it&apos;s plausible?" is often a better way to persuade; one wishes to do the same thing for system 1.